This post is part of SP14 Keynote highlights series where I provide some highlights of the next version of SharePoint. These highlight are from the SP24 Conference Keynote that Bill Baer delivered. How many occasions have you tried to access a document in SharePoint, but end up having to click through a long set of links to find it because you can’t remember the URL? OK, this is not an everyday issue, but we do use SharePoint to store documents and we use SharePoint sites to create contextual containers to store documents in. In someways these SharePoint sites slow us down from accessing documents harder. In the next version of SharePoint (SharePoint 2016) we might find a new method to access Document Libraries called Site Folders. Site Folders will provide a list of all Sites that we have access to that contain Document Libraries (a.k.a Site Folders or Site Libraries) and will be available from OneDrive for Business. 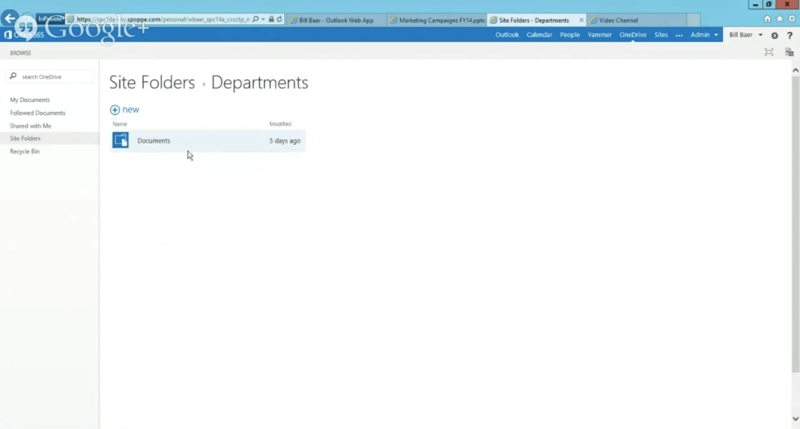 Site Folders coming to SharePoint 2016. Users will be able to click-through into individual Sites from the Site Folders page to easily discover Document Libraries each site contains. 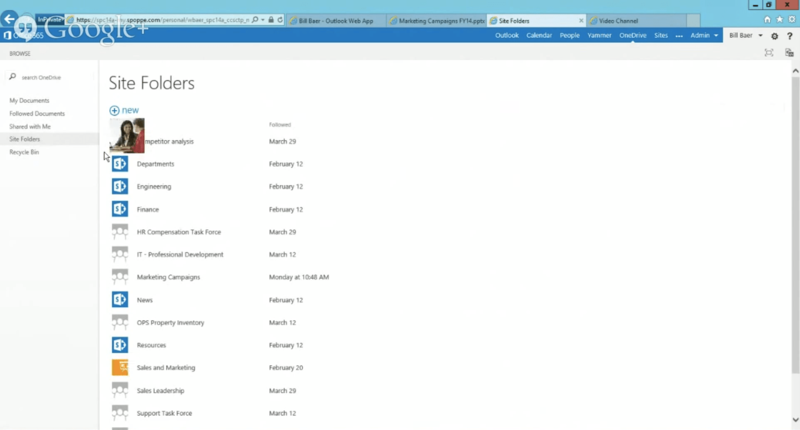 Libraries visible through the new Site Folders area coming to SharePoint 2016. I wonder how this will impact how with architect document management solutions. Search is becoming more and more powerful that we are shifting to an era where Information Architecture and Taxonomies become less relevant (or maybe more relevant behind the scenes), time will tell! I have an idea what Microsoft are trying to do here, watch this space as I’ll provide my own mock-up and example soon. Join me over the next year as I discover more news and information about the next version of SharePoint and Office 16 by following my #Office16 tag. We all do this. We need to send a file to someone via email and we just attach the file to the email and press send. 60% of mailbox storage is allocated to attachments. What we should all be doing of course is saving the attachment to SharePoint and including a link to the attachment instead. Microsoft may be about to make this much easier in the next version of SharePoint and Office (SharePoint 2016 and Office16) by slipstreaming the entire process and integrating Outlook with OneDrive for Business in Office 365. 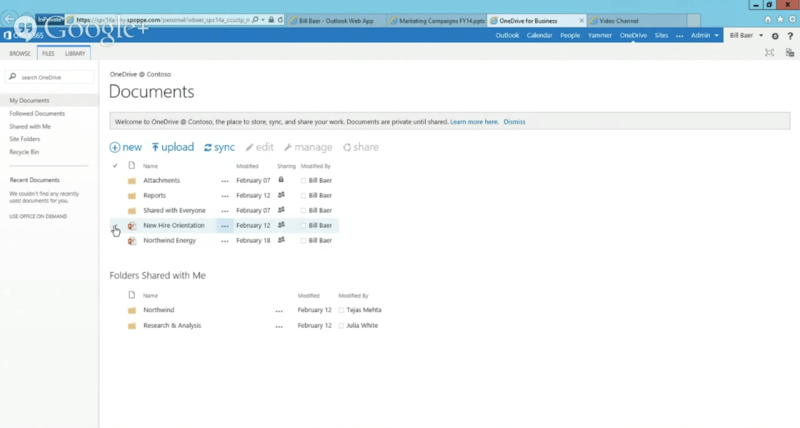 Attachments will be stored in a “Attachments” folder in the users personal library in SharePoint Online, known as OneDrive for Business. Attachments folder in the next version of SharePoint – SharePoint 2016. Each attachment will be secured to those on the recipient list of the originating email. Outlook attachment store in OneDrive for Business. Benefits of storing attachments in OneDrive for Business include reducing overall email storage requirement but what do users care…general they don’t, not about storage requirements anyway. But what about providing themselves and their recipients with the ability to collaborate on attachments centrally and even use Co-Authoring. Imagine how much email traffic will be reduced because everyone has access to the same attachment. 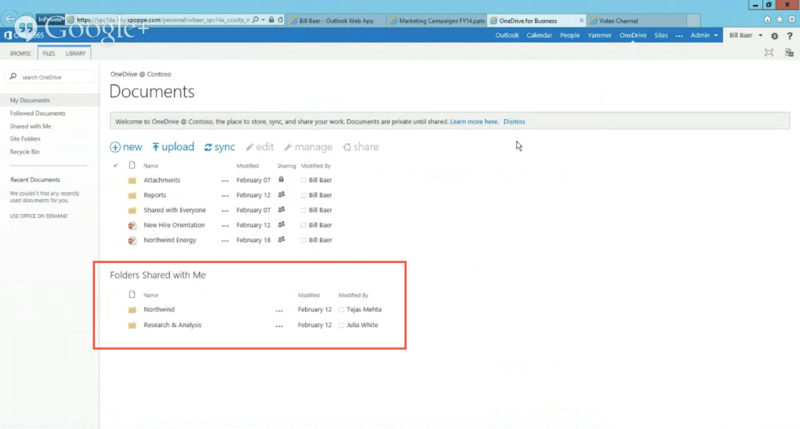 Outlook attachments stored centrally in OneDrive for Business. There are times when storing attachments centrally SharePoint 2016 or whatever it becomes will be useful but not in all examples. Most of us are fortunate to live in a very connected world but there are times when we’re not so connected. This exciting change would mean at time an email attachment would not be accessible, even though the original email is available on a mobile for example. I look forward to hearing what others think about this new feature. The Command Surface that is available at the top of List and Library pages is being update in SharePoint Online over the coming weeks. A message about this change has been availablr in the Office 365 Message Centre (MC4558) for some weeks now. 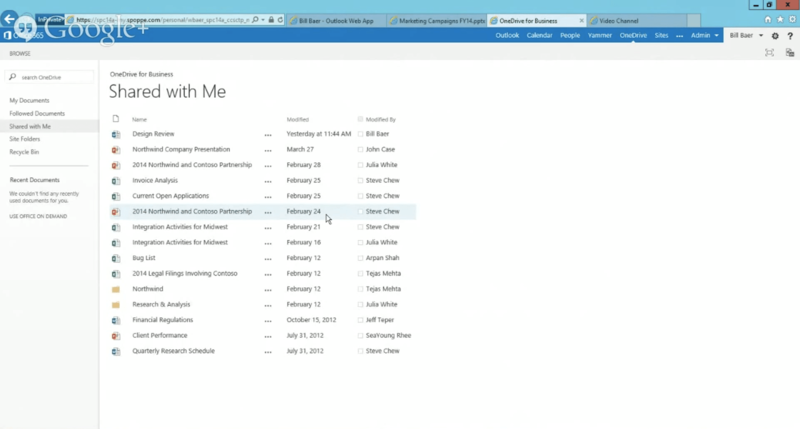 Command surface coming to SharePoint Online. The change is intended to simplify access to common commands. The commands are now enlarged, include icons and there are additional commands to sync, edit, manage and share documents. Close-up of the new command surface coming to SharePoint Online. While this is not a new feature to SharePoint, it does demonstrate the continuos investment and development that is happening in Office 365 and SharePoint Online. Better still it is an further example that Microsoft are listening to customers – in this example, how commands were not easily accessible and hidden in the ellipsis menu. This post is the first of my SP14 Keynote highlights series where I provide some highlights of the next version of SharePoint. These highlight are from the SP24 Conference Keynote that Bill Baer delivered. Something to lookout for in the next version of SharePoint (possibly SharePoint 2016 or Office16) or even soon is a summary of documents and folders that have been “Shared with Me”. It appears that the “Share with Me” page is already available in SharePoint Online however the summary of folders shared with you isn’t. Folders Shared with me summary in the next version of SharePoint. 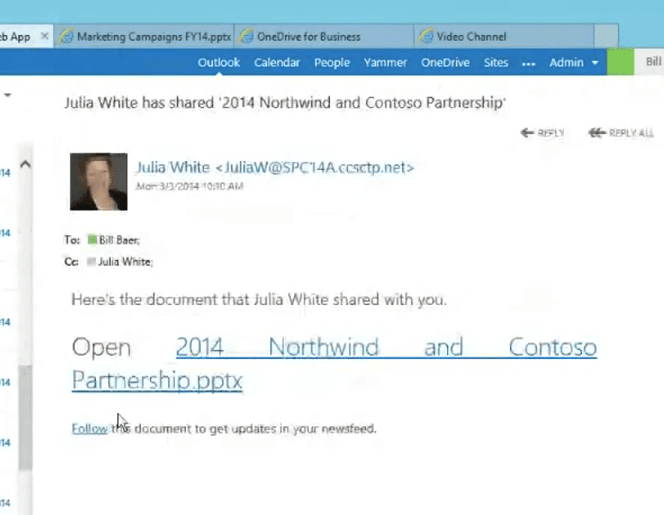 It’s pretty self explanatory but a list of documents or folders that have been shared with you will be displayed in your OneDrive for Business site. List of items Shared with me in the next version of SharePoint. I wonder if this might extend to include scenarios such as multiple environments or Office 365 sites, to create a true consolidated view of files that have been shared with you. I’m always searching my inbox to find emails from colleagues where they have shared files with me a one single place for this information would be well received.